Freedom's not just a one-off TV event | Mike Hitchen Online: Mike Hitchen Unleashed - telling it like it is! The cry of "freedom" swept through Tahrir Square, carried by The Wind of Hope, to every corner of the world. People of all faiths and ethnic backgrounds gathered to celebrate and share the joy of the people of Egypt, who for thirty years have been shackled by the iron chains placed around their hearts and minds by Hosni Mubarak. In countries far away from the banks of the ancient and historic Nile, people rejoiced and cried, "Mubarak is gone" "Mubarak is finished" "Mubarak has fled". Yet three weeks ago, many of those same people would have asked, "Who?" The man who for the last 18 days has become the symbol of tyranny, went largely unnoticed by those outside Egypt, even though for three decades his thugs attacked the minds and bodies of those courageous enough to speak out or try to defy him. Yet the last 18 days have seen millions become instant experts on the man, his regime, and his deeds. That's the thing about despots - they are there but few outside their oppressed domains take any notice until Prime Time News decide the deaths of activists make great viewing. Then, and only then, do the Unknown become Tyrant of The Month. I'll set you a challenge. Stop 100 people in the street and ask, "What do you think of Alexander Lukashenko?" The vast majority would not know who you were talking about and no doubt you would be asked, "who does he play for?" 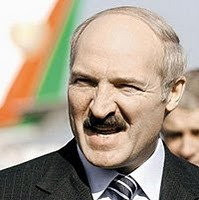 Since 1994, Lukashenko has been the President of Belarus. He has been labeled Europe's last dictator, and his oppression, brutality and total disregard for human rights in any shape or form, have been the hallmark of his corrupt reign. Like Mubarak, President Lukashenko is a man who needs to be removed - but it is unlikely that will happen any time soon. Though even as we speak, there are those brave enough to take to the streets to protest his dictatorship, sadly for them, their cause is not seen as fashionable enough by the executives in media boardrooms, who decide who has enough pulling power to put viewer's bums on their seats as they eat their TV dinners and demand the resignation of a man they have only just heard of. Let's celebrate the removal a man in Egypt, (though I remain skeptical that his departure will bring about the change we all wish to see) but let us also be mindful that there are Mubaraks in many countries. Do not not wait until we suddenly have highly paid political analysts in nice ties and suits sitting in a studio giving us their opinion about someone that until then, we didn't know existed. Be your own analyst - raise your own and others awareness of tyrants and support those, who like the people of Egypt, march and die in the name of freedom and democracy. Freedom is a lot more than a one off Prime Time TV event - it is literally a matter of life and death, and each person who marches or suffers the blows of a tyrant's henchman, deserves equal support, encouragement and exposure.